“Religious Tourism” is a considerable niche in the travel world. The Lenten season, upon us now, preceding Easter and Passover, came in via Ash Wednesday on the heels of Mardi Gras celebrations and carnivals that pumped millions of dollars into traditional party places like Rio de Janeiro and New Orleans. But billions more is spent by 300-million faith-based travelers and groups flocking to pilgrimage destinations including Jerusalem, Mecca, the Vatican, and other significant spiritual sites, according to the World Religious Travel Association. “For me personally, the opportunity to travel and see the places of my faith is spiritually transforming. Knowing that I am standing in the places that I have read and studied in my Bible is like no other experience,” says Jill Daly, the Israel Ministry of Tourisms Midwest Region deputy director. The United States is the top source of tourism to Israel, with 602,000 visitors in 2014, a record-breaking year, representing 20-percent of the total. The evidence of miracles – abandoned crutches, canes and walkers – are mounted on a pillar at soaring Sainte-Anne-de-Beaupre Shrine, known as a “place of miracles” for 350 years near Quebec City. One-million travelers of all faiths visit the dramatic paintings, mosaics, stained-glass windows, sculptures and sanctuary in the current magnificent basilica. “The typical religious traveler is age 45-50 and older. 70-percent of what they do on a trip is faith-oriented. They tend to donate to the shrines and churches and they also seem to like to shop,” says Marouan Bel Fakir, a tourism official with the Canadian government. Churches, expensive to maintain, need financial support, so they even allow visitors during services, though they ask that photos be taken only afterward. Some, such as historic Westminster Abbey, in London, charge an admission fee for complete access and for those not attending a service. Others, such as the Sacre Coeur and Notre Dame Cathedrals, in Paris, charge only for access to the scenic views of the city – and the gargoyles – available by climbing up in the spires. There is no cost to see Pope Francis twice weekly in sprawling St. Peter’s Square, but, due to the volume of visitors, access to the Vatican Museums, Sistine Chapel, catacombs and basilica is regulated. 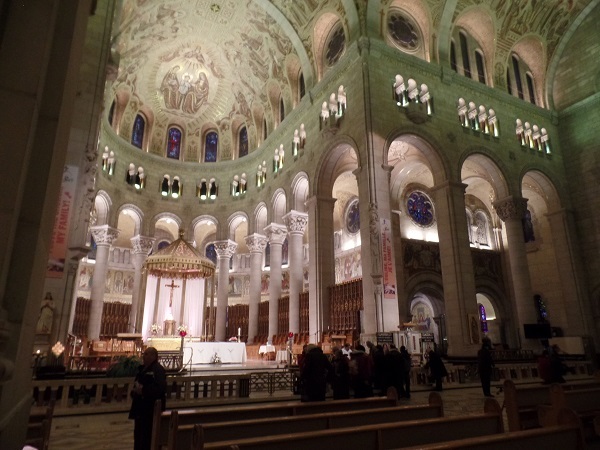 “Montreal is known as the ‘City of Churches,’ and receives organized group tours from as far away as Mexico and Korea. American Catholics also travel in a very organized fashion. Religious tour operators make arrangements with local hotels and restaurants for advantageous prices,” says Bel-Fakir. Faith Travel Association statistics indicate 50,000 churches in the United States offer travel programs. Biblical figures enchant the imagination as travelers literally walk in their footsteps and seek their inspiration.